Non enveloped, icosahedral virion with a pseudo T=25 symmetry. Virion size is about 66 nm with apical spikes of 20 nm. 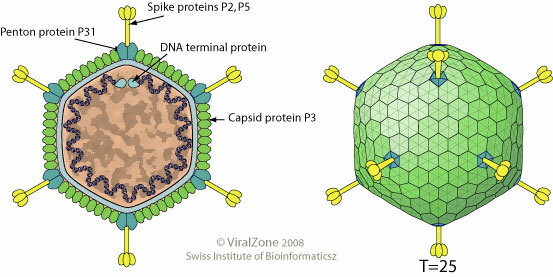 The capsid encloses a inner membrane vesicle within which the genomic DNA is coiled. Linear, dsDNA genome of about 15 kb flanked by inverted repeats. Encodes for 30 ORFs. Replication is protein-primed. Adsorption: the phage attaches to target cell through its spike protein P2. As a result, a protein complex composed of P2, P5, P31 and a part of the capsid (p3) is released, which produces a hole in the capsid. Internal phage membrane transforms into a tubular structure that protrudes through the hole in the capsid and penetrates the host outer membrane and peptidoglycan layer, to fuse with host plasma membrane, releasing the viral DNA into cytoplasm.